On the Resia-Verona cycling tour you will travel over a range of 1500 m in altitude from the Alps through sunny Italy to Lake Garda and on to Verona! We recommend this easy and beautiful cycling tour on the Adige cycling path in the Venosta Valley to all nature, sports and culture fans. The tour leads from Lake Resia via Merano (Hotel in Merano) to Bolzano and on to Verona. This tour can be done in spring, summer or autumn. Along the cycling path you can admire interesting sights like castles, vineyards, orchards, beautiful mountain scenery and long stretches of unspoiled nature. On the Resia-Verona cycling tour you will travel over a range of 1500 m in altitude from the Alps through sunny Italy to Lake Garda and on to Verona. You can reach the Resia Pass, Nauders or Resia by car, train or bus. Leave Resia at about 9 a.m. and cycle along Resia Lake with a view of the sunken church of Curon in the medieval city of Glorenza. The target destination of the 2nd day is Silandro, the main village in the Venosta Valley. Castles can be admired along the route or high above the route, like Juval Castle of mountaineer Reinhold Messner. Enjoy the wonderful panoramic view of the impressive Ortler mountain massif and Stelvio Pass, and of the beautiful city of Merano with its Mediterranean vegetation. We recommend an overnight stay in the centrally located Hotel Westend only a few minutes from the center of Merano. Choose from two routes in the direction of Bolzano: cycle along the Adige River or through beautiful orchards via Lana and Appiano. Along this route you can admire the Messner Mountain Museum in the castle ruin of the Sigmundskron. In Bolzano you can visit Ötzi, the glacier mummy, and other interesting exhibits in the Museum of Archaeology. 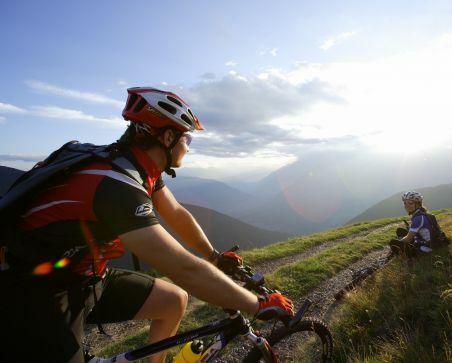 Wonderful cycling trails are found here along the Adige River, some leading through orchards all the way to Salorno. This is where the German-speaking area of South Tyrol ends. The tour continues to Trento, where we would recommend a visit of the old town. This stretch continues along the Adige River via Rovereto to Mori. From here the cycling tour leads in a westerly direction to Lake Garda. After a short ascent over San Giovanni Pass you can enjoy a downhill stretch along the lake to Torbole and on to Riva. From here you will cross the lake by boat. The final stretch takes you through vineyards to Verona, one of the most beautiful cities in Italy, with its numerous interesting sights (the Arena, Juliette’s house, the old city wall).